Microsoft Excel is the powerful and advanced spreadsheet application which comes as part of Microsoft Office. EXcel allows users to define name for individual cell, cell range, function, constant or table in order to be used in formulas. The use of names in formulas make the formulas much easier to understand, track and maintain. If you commonly create and add defined names, table names or named ranges in Excel, you may no longer need some of them. 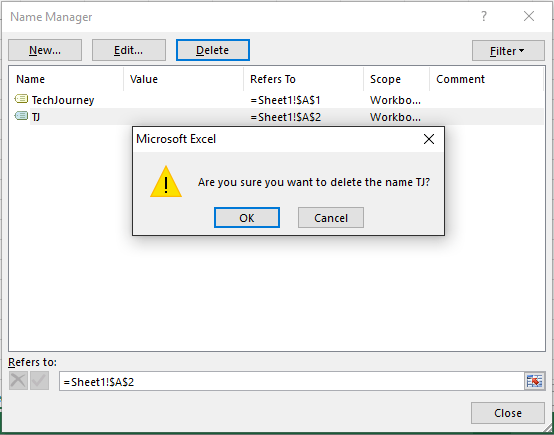 To keep the workbook and worksheets tidy, it’s a good practice to delete and remove unwanted or unused names using Excel’s Name Manager so that the workbook is clutter-free. Open the workbook that you want to clean up the defined names in Microsoft Excel. On the Ribbon, go to Formulas tab, and tap or click on Name Manager in the Defined Names group. Select the name or names (holding down Ctrl key to select multiple names, or Shift key to select a range of names contiguously) that you want to delete. Click or tap on Delete button. Press OK again to confirm the deletion.